Kombi rescue. The VW bus was parked in the Alabama woods before it was 10 years old. 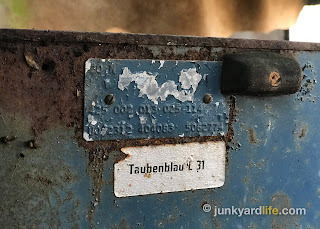 Serving duty as a little girl’s shiny blue playhouse before the rust found residence. Years later, it became a makeshift storage building, home for discarded lawn mower parts and bushels of aluminum cans. 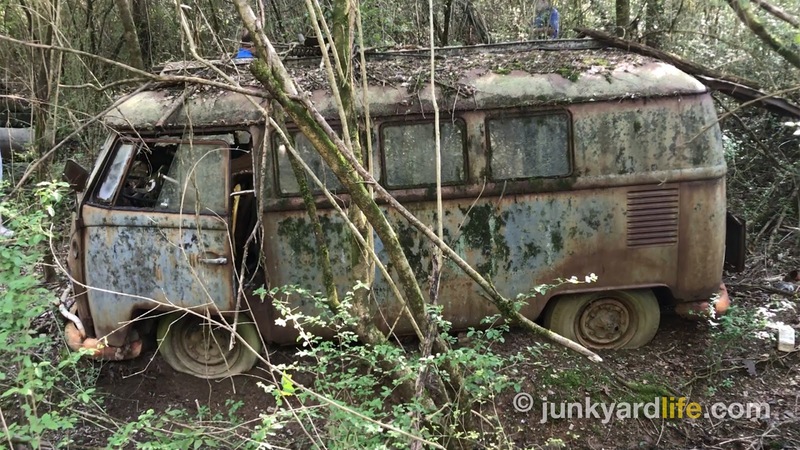 Planted in a low spot between two hills, the castoff, split window bus was a landmark. Sucked into the dirt and leaning, the VW was a permanent family member. 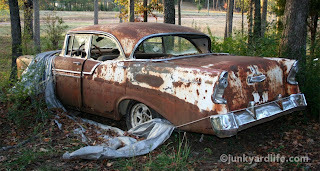 A family member saturated with cancerous rust from the belly up. The Volkswagen was dying. 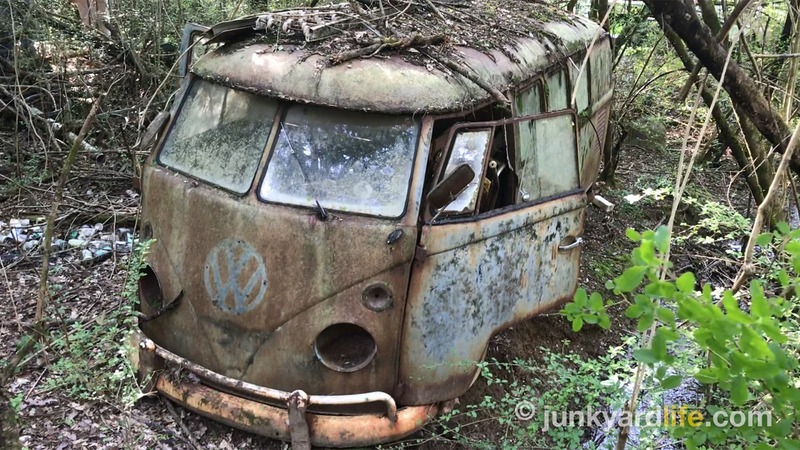 "Would you be interested in an old VW bus?" The message appeared on my Facebook. An iconic VW. Could it be one of those window buses? 21 and 23 window VWs are gold mines. I didn't hesitate. My soon-to-be deal was told to anyone who would listen. The owner sent me a couple of photos, which only ramped up my enthusiasm. It was not a window bus — but she said I could just make an offer. Cheap? Yes. 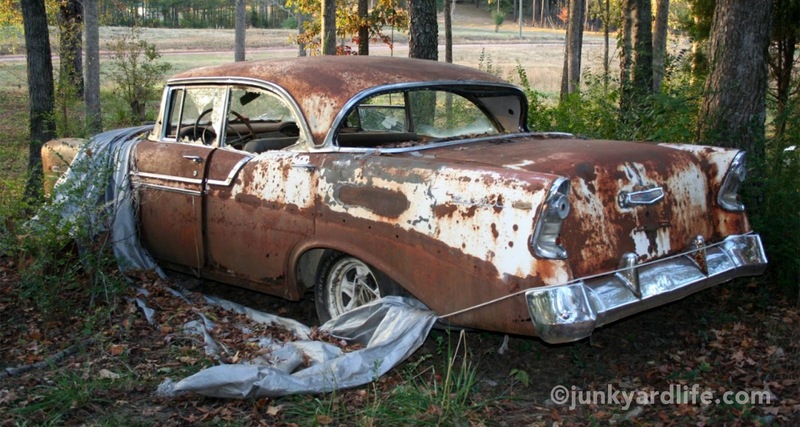 My kinda junk yard deal. 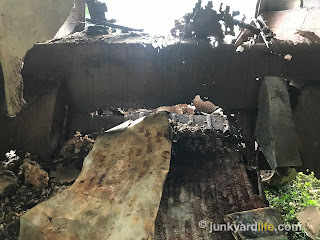 Or junk woods deal as it turned out. 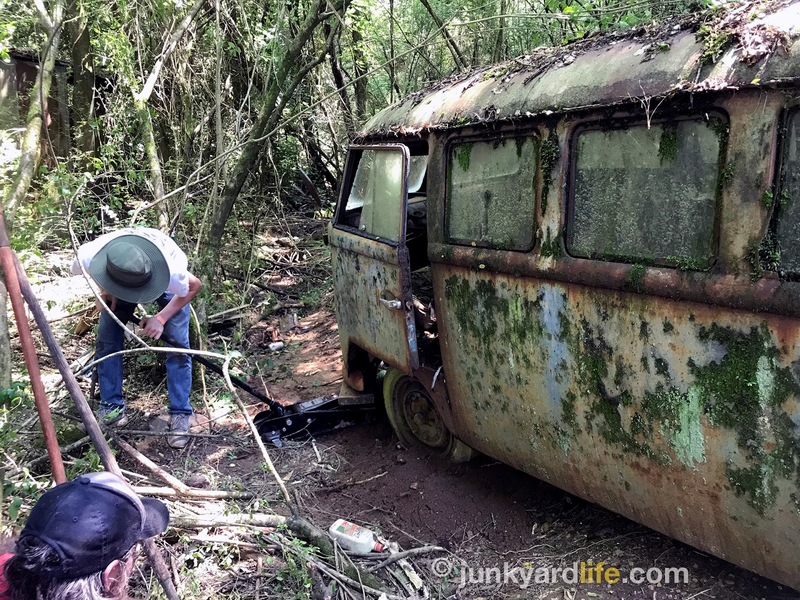 The 1965 VW Kombi sunk into the mud by a stream between two hills. A 1965 VW Transporter Kombi. 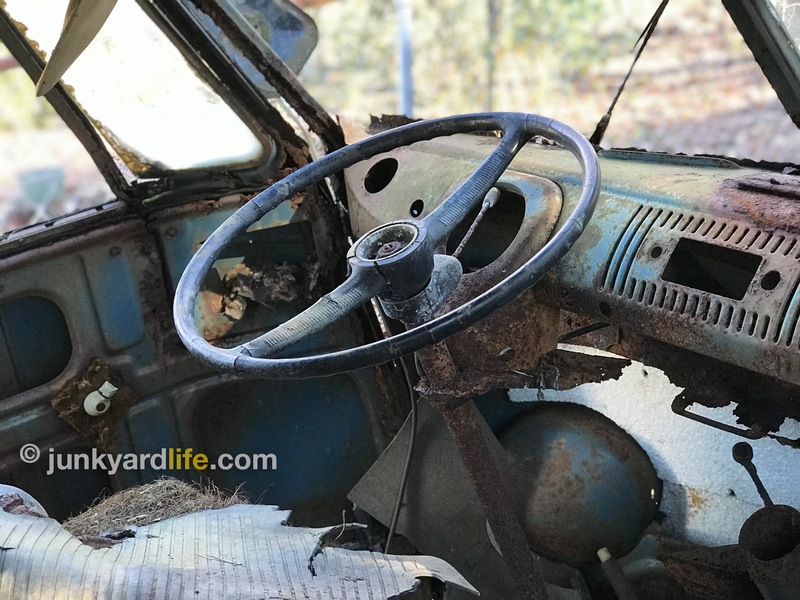 This model VW bus was a forerunner to the modern day crossovers and SUVs. The Kombi’s rear seats could be removed to haul cargo or remain in place to haul 7 passengers. This was before anyone imagined folding the seats into the floor. A true utility vehicle that appealed to those needing a multi-purpose work vehicle or an active family hauler. VW Kombi bulkhead (wall) separates the front seating area from rear cargo/seating area. Notice the floor is gone! Fifty years ago, VW Transporter models included the Panel Van, the Kombi, the Microbus, the Pick-Up and the Double Cab Pick-Up. VW provided a wide variety on the bread box bus assembly line. 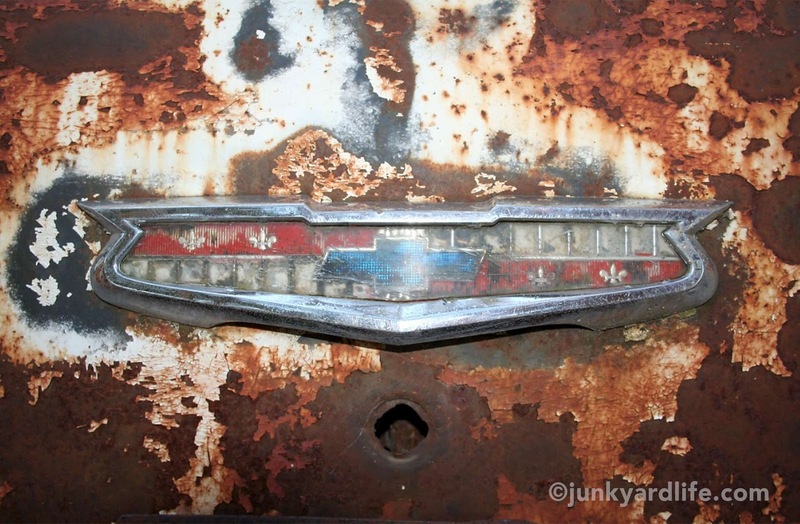 It took a while to wrap my head around the intricacies of these early VW Transporters. I grabbed a book, "The Complete Book of Volkswagens" by John Gunnell, to learn more about the VW bus. Car and bus. Easy. Look deeper. The first VW model, the original VW Beetle, is known as a Type 1. The Transporter (VW Bus), the second VW model, is a Type 2. Here’s where it gets squirrelly. The first generation Transporter design (Type 2), built from 1950-1967, are identified as T1 (first gen) and had a split front windshield. 1968 thru 1979 model Transporters are identified as the T2 (second gen) design and feature a Bay Window type windshield. The terminology is confusing to non-VW people. I could tell you more baffling details about the 1980-1983 VW Vanagon but I’ll stop here. Just keep your T1 or Type 1 conversations separated according to bus or Beetle. We’re just gonna talk about the VW bus now. Jungle scene? No, just Alabama woods. 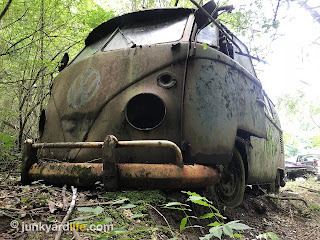 The 1965 VW Kombi bus spent 40-plus years in these woods. How did the VW land in the woods in the first place? This VW bus rolled onto the property of Steve and Janice Thomas’ house courtesy of an ex-brother-in-law. Extra vehicles tossed in the woods were no big deal for Janice. Her husband, Steve, raced round track cars back in the 1970s. The VW bus sat out of the way and became a storage shed after the playhouse years. The bus disappeared into the greenery of the wooded Alabama property. Why not sell it back then? 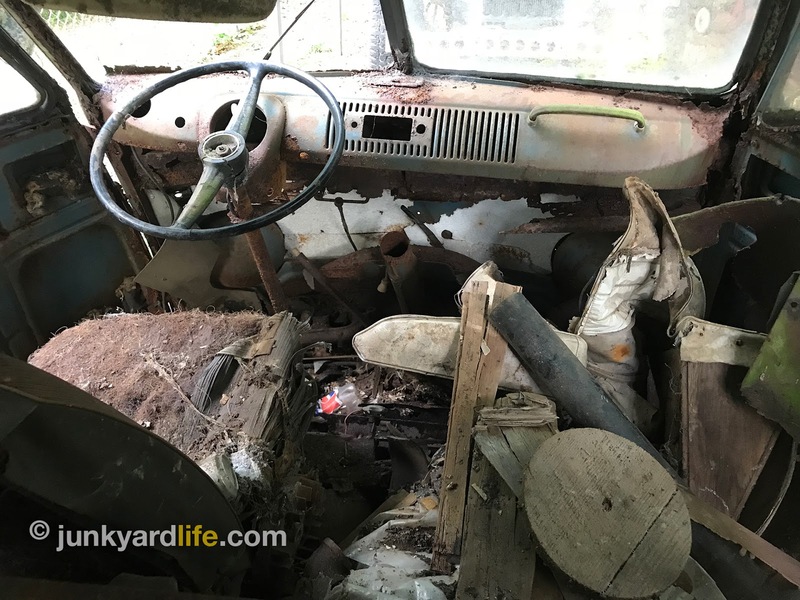 Demand was low for junkyard VWs in Alabama in the 1970s. Drivers were wary of traveling in these on highways because of their low horsepower and wobbly road manners, especially in high wind conditions or while getting passed by a tractor trailer. Die hard hippies and anxious teens looking for their first vehicle gobbled up the cheap buses. For everyone else, used, better handling transportation alternatives could be had for a few hundred bucks. Worn out Beetles and bus bodies sold for next to nothing. Junkyards sold them for $25-$50. 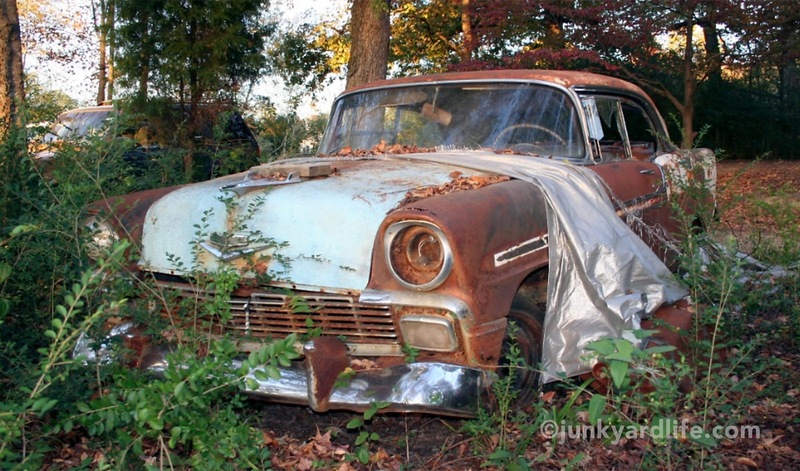 Many were left to rot or given away like this one. 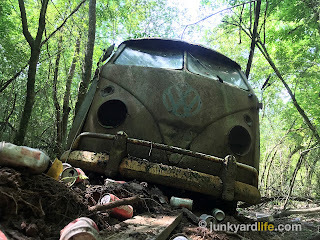 1965 VW bus found sitting on the front bumper after sinking into the soft mud between two hills. 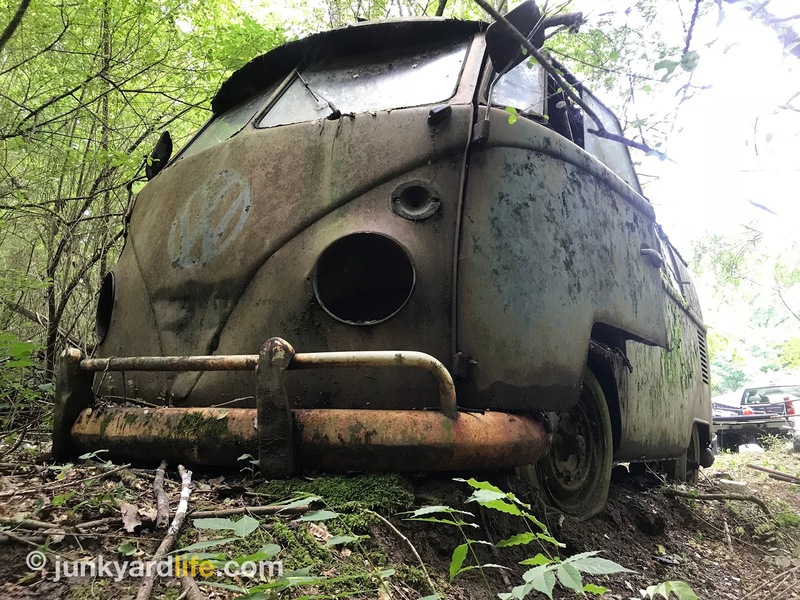 First generation, split window VW buses wrangled from the jungle, swamp or mountain top have occurred all over the world. 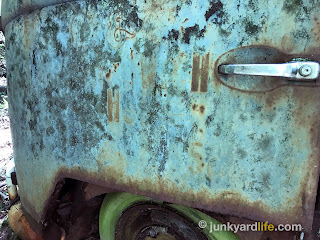 This 1965 Kombi was uncovered in a combination of all three terrains. The wooded sanctuary between two small hillsides and bisected by a rainwater runoff ditch was not easy to reach. I clamored over, under and through trees, vines and bushes to get my hands on the bus. The driver’s side was buried in the mud inches away from a trickling stream. Scales of moss covered the slab sides on the boxy VW body in a sheet of fungus. Somehow all the glass remained intact. Taking inventory of the good parts was quick. Tail lights? Check. Headlights? Gone. The front doors sag and their outer shells flap. 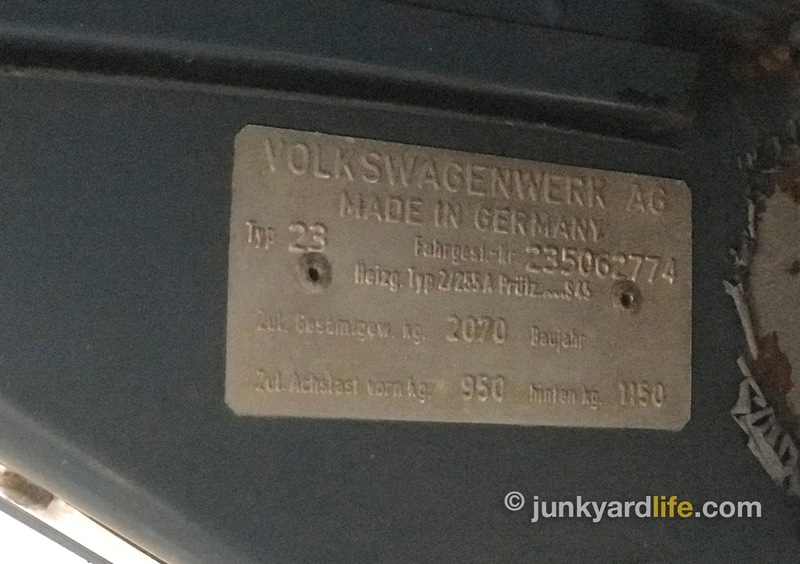 An empty silhouette remains where the big, 14-inch round VW emblem was once mounted on the nose. Inside the worst damage couldn’t be overlooked. A dirt floor visible where the floorpan once lived. The headliner’s cardboard backing hangs down and touches the frame. A complete set of VW wheels, welded tight with 44-plus years of iron oxide, are a good thing, right? So much damage but it still looks cool. “Take a picture, it’ll last longer,” was my first though when I considered moving the bus. I want to move it, but how? Runoff rainwater eroded ground under driver's side of 1965 VW bus. My son, Joe, maneuvers a floor jack under the 1965 VW bus' front bumper. Tree cutting was inevitable. Shoveling the tires out of the ground, a given. Digging out the frame and jacking up the transaxle to free it was par for the course. The problem was trying to move it without damaging the body or breaking glass. I know there wasn’t much to lose, but my goal was to move it to my house in the same condition that I found it. My plan was futile. Imagine moving a china cabinet - full of mom’s prized dishes. You know you cannot move it without breaking something. Scratch that – breaking lots of things. During relocation of the 1965 VW bus I managed to add a nice twist, or, as they say in France, torque, into the body. A gentle tug with the 2004 Chevy 2500 4x4 was followed by some strong arm tractor action, then back to the truck for more controllable oomph. The rear end/transaxle was pulling away from the body of the rusted VW when pulled with our tow rope/chain setup. The lower half of the bus body had no structural support to stabilize it. 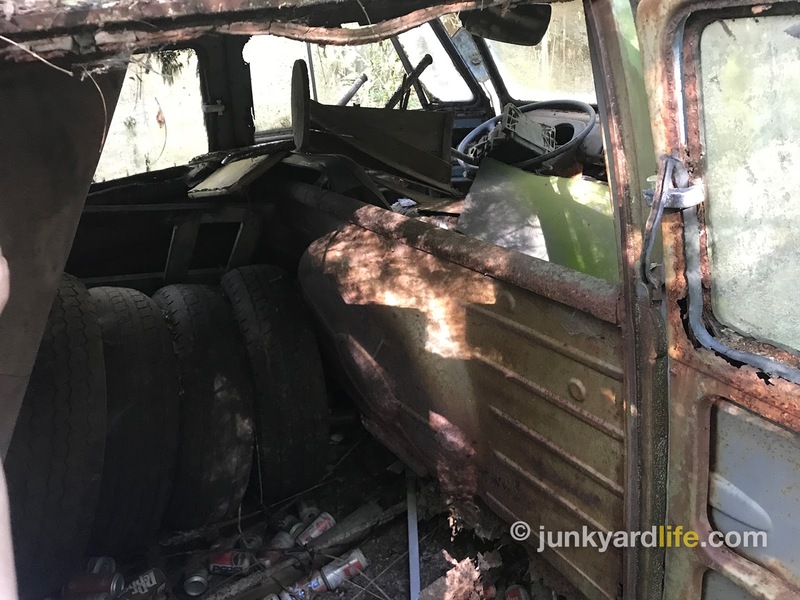 Moving along the uneven terrain and out of the woods would be cruel and unusual punishment to what remained of the VW carcass. To remedy that, one chain was attached to the transaxle and another to the front support bar under the dash, then snugged tight using a come-along. After all seemed secure and a bit more excavation from underneath the wheels, we applied more grunt from the 6.0 liter LS engine with Ron Kidd behind the wheel. That’s when we managed to yank loose the center support bar below the dash. The rear wheels moved back more than a foot, which caused the back tires to push the rear corner of the bus’ body up. Not a good look. No going back now. The split window bus' bumper guards and hollow headlight buckets make for a mean and scary VW. Once the VW was pulled clear of the woods, a wrecker was called so it could make a careful trip home via a rollback. I asked the wrecker driver to take it slow and easy. No luck there. 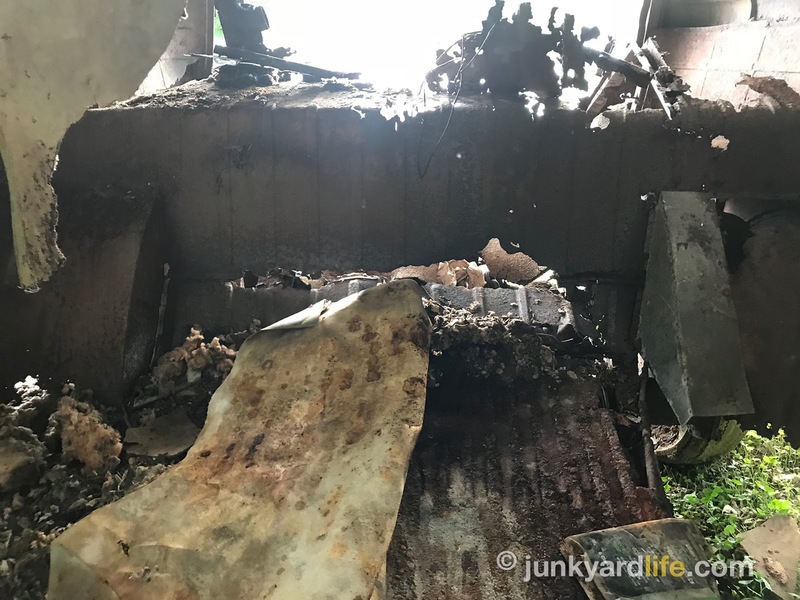 During his first maneuver out of the driveway, with the VW swaying high atop the wrecker, he pulled out too wide, causing the driver of a giant, oncoming truck to lock-up his tires. After the smoke cleared, I watched from behind as the erratic driver proceeded to hang the little VW in the wind at blistering speeds. 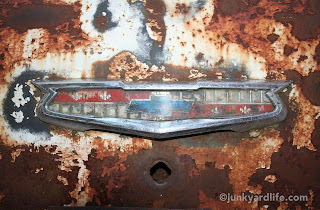 Vigorous flapping and rust dust pelted my truck as I followed behind. Somehow, the remains of paper thin sheetmetal held on for the duration of the trip. The unloading process was as smooth as a bouncy house at a birthday party. Against my protests, the driver demonstrated the shake, rock, shake technique to slide the VW off the wrecker. The windows convulsed. The body creaked and groaned. Bitter, death sounds were made as the VW Transporter lost the battle with gravity and it shrieked – metal against metal – down the bed of the rollback. 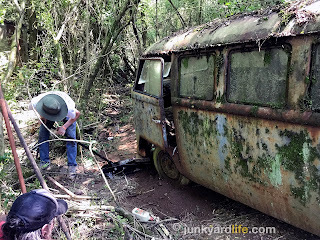 After being pulled, stretched, twisted and shaken the Kombi looks a bit worse than she did in the woods. Clearing out most of the junk that survived the trip inside the bus was my first priority. Then I scrambled to make the sad remains of the bus more pleasing for my neighbors. A bath was in order. I hoped that more of the original VW Dove Blue paint would show up after a good scrubbing. The bus sits. I have no grand plans to restore the Kombi. 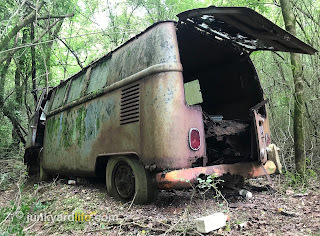 I pulled the front and rear bumpers for Keith Lively to use as templates for the Mega VW Bus build (Part 1 video, Part 2) that he is working on. Right now I’m savoring the adventure and happy to look out in the yard at the 54-year-old bus. Who knows how long the remains of the bus will last? VW KOMBI VIDEO COMING SOON. 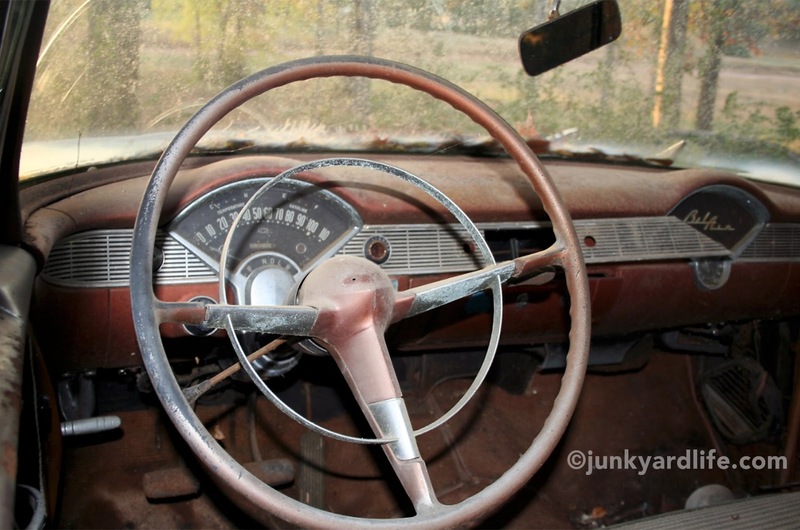 Inside the Kombi is a mess of rusted-through metal. The floor is gone and the shell is unstable. Below the dash and split window in the 1965 Kombi the center post separated due to a feeble attempt at holding the bus together with a central chain connecting transaxle to center post. 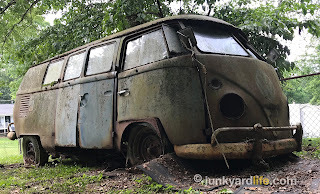 1965 VW Kombi chassis i.d. plate on right-side of overhead air vent. Type 23 Kombi. 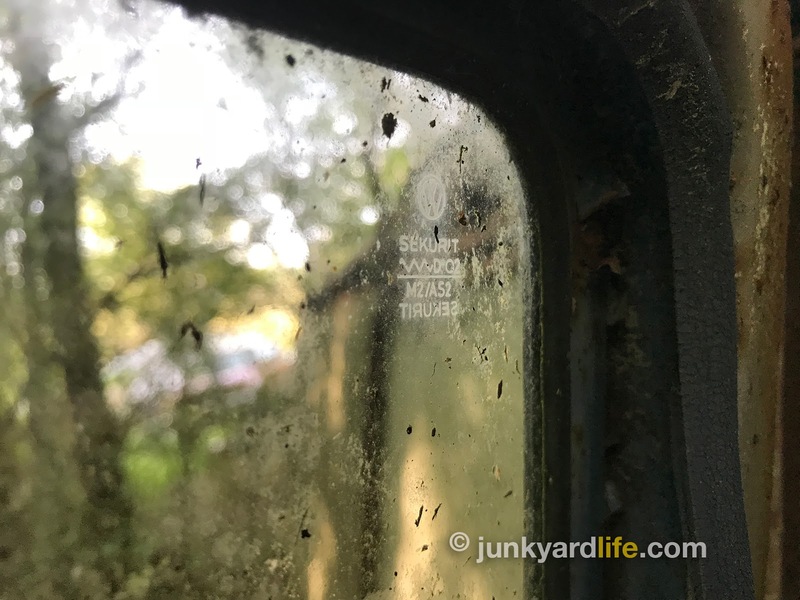 Lettering on VW Kombi driver's door could be a clue to a previous role as a work-a-day company vehicle. Rear bumper on 1965 VW Kombi eaten away by rust. 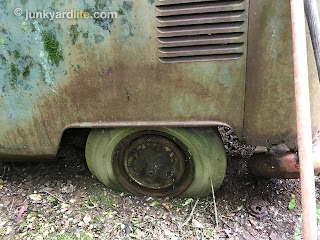 Rust, moss and dirt surround VW bus rear wheel. 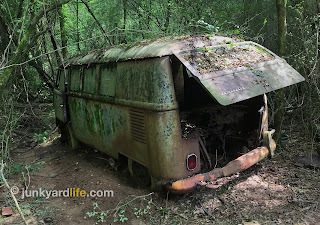 I don't know if I will ever see an early VW bus in the woods like this again. It was a good day. 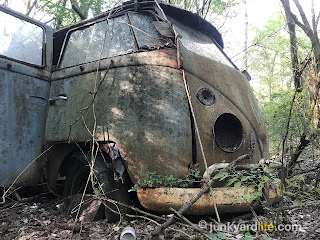 1965 VW Kombi vehicle i.d. plate behind right-hand front seat. Code 013 for middle and rear seat option. Code 31 Dove Blue paint visible. Behind the wheel look at the 1965 VW Kombi. One side of Safari glass came loose from frame (but still intact) during transport.